Adama is a Hospital And Clinics Integrated For Skin And Plastic Surgery. It located in three cities in Saudi Arabia. In Riyadh: Makkah Road - In Front Of King Fahad Medical City. 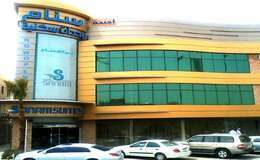 In Jeddah: Prince Mohammad Bin Abdulaziz Street, Bin Homran Trade Center on first floor. Khobar: Custodian of the Two Holy Mosques Road, Rabiah & Nassar Building. Adama Hospital aims to provide a culture of advanced health care to patients in a friendly environment ensure that each patient will get the Best treatment possible. The Hospital And Clinics Are Committed With The Highest Local And International Professional Standards To Provide Health Care For The Auditors Through The Selection Of Medical Staff Holds a Fellowships From North America And Certificates Of Conformity Of Arab And European Countries. The hospital offers this services: Plastic Surgery, Dermatology, Laser Treatment, Hair Transplant, Laboratory & Radiology and Skin Care. Adama Hospital includes three Clinics: Dermatology, Plastic Surgery, Hair Transplant.